With the truck load of dance games being released over the past few months, The Black Eyed Peas Experience, henceforth known as BEP Experience, certainly has its work cut out. Not only must it hold its own against other dance games that are well established and into their second or above instalments in their respective series (Just Dance 3, Dance Central 2 and more) but they must almost cope by being limited to just one set of artists. Will it have the ‘Boom Boom Pow’ or is it just another ‘Hump’ in your wallet? Although BEP experience is focused for group play there certainly is a story and questionable as it is, it provides the single player campaign with a sense of continuity and organization. That said, it is not as deep or as fulfilling as one could hope for. Heck what am I saying, there’s no story whatsoever. Much like a train, the campaign follows a single track; the player is given a chance to create a character when they begin by choosing from a series of templates that are limited in range. Although you are stuck with that specific character throughout the rest of the campaign without the ability to re-select, you will have a series of modification options at your disposal such as clothes, tattoos and accessories. These are unlocked with the game’s currency (followers) that you gain from completing each stage. Followers are not spent however so items are not purchasable, rather they are unlocked by gaining a certain amount of followers and succeeding challenges that presented to you by the Peas members. I guess they all have the humps! All songs included on the disc are available from the start of the campaign and it is down to the players choice and skill level to complete them one by one in any order and attempt to score as high as possible in order to win followers. Songs are divided into different skill classes that are clearly labelled, unfortunately the range in which points are available for each track also differ enormously. You may find yourself earning a B rating with 75,000 points on one track and 20,000 on the other. Although that is being a little picky, it’s certainly something worth fixing for the game as it can be confusing to know how well you are doing when keeping an eye on the score through different tracks. The campaign is also multi-player friendly but not online, if another player is nearby and wishes to join they can unfortunately the same cannot be said about leaving which can often be infuriating. Players are also free to karaoke as the lyrics of each and every song are displayed below and again the performance is ranked and score is increased depending on the vocalist’s performance. Each song is split into four stages where routines are slowly implanted into your head until the last stage where you perform with the Peas themselves and attempt to fumble through the choreography as a whole and try to impress the Peas with your moves. As you slowly progress through the game you will find yourself ‘earning’ new venues depending on the amount of followers you have in total. When a new venue is unlocked the Peas themselves transform it magically in front of your eyes through the use of mini cutscenes and it makes you wonder why the developers couldn’t have magically implanted a stronger story. Surprisingly, this element of the game stands out a cut above the rest. I’m not trying to imply that the visuals are groundbreaking, perhaps far from it. 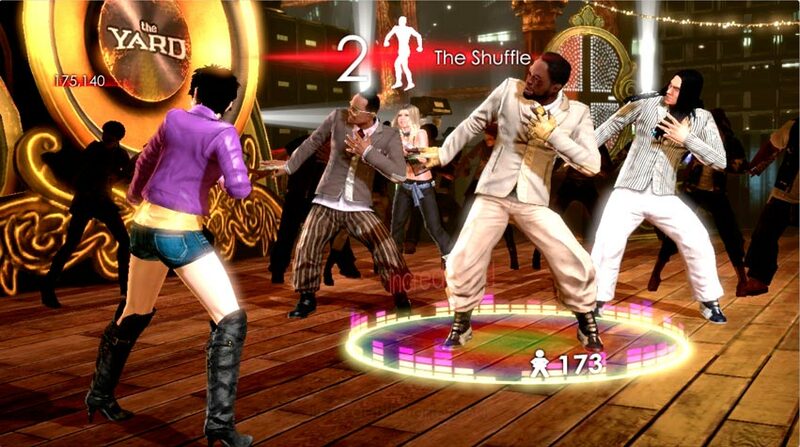 However in the context of a dance game, the art style is very much focused. The venues themselves are full of life and colour as are the dancers that accompany you or teach you. The Peas also look the part, appearing in their iconic selves in separate attire for each individual song. The world or rather venues that the dances take place in are detailed to the brim with modelling and texturing that leaves no chance to complain and even if it did not, is there really a chance to stop and look around when in the middle of a heated dance session? Ok we're ready for take off! 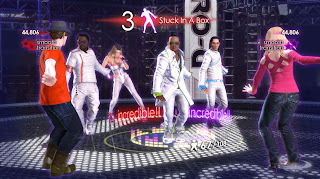 Menu design is also excellently suited for the Kinect sensor and as intuitive as any other game although kinetic scrolling through the song library is sourly missed and instead replaced with a very trial and error based movement in order to find and successfully initiate your chosen song. 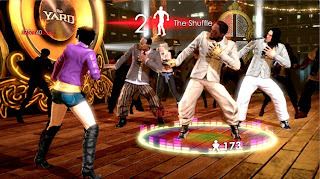 The world is also often accompanied with real dance videos for the individual songs through both the menu and gameplay and it goes to show that this game is taking itself very seriously on being dedicated to the Black Eyed Peas. I shall start this section off by reminding you guys that this is a dance game so how effectively does it manage to stay true to itself? Well, firstly I would like to mention that ALL Kinect games are limited to how effectively the sensor can perceive you and unless the most optimum conditions are reached in lighting, distance and possibly other things too, the sensor will not react to every movement nor judge be able to effectively you. I am not only saying this because I am sour at losing and need something to blame( though that very well may be the reason lol) I am saying this because it is usually true. I tried the game through various and often checked the tuner settings to ensure that the Kinect was always tracking me, unfortunately it was not. As for the game itself, it managed to cope excellently when tracking a single person or two players however any background activity that occurred in the camera would usually interfere with the game and cause the sensor to lose sight. But seeing as this is only not the software’s fault I shall not be deducting too many points for this shortcoming. Indeed the game plays well enough when there is no interference or distractions. 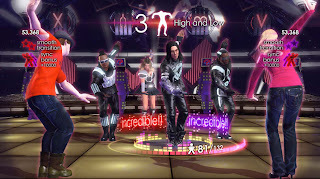 It is also very accommodating for up to four players (two vocalists, two dancers) and the vocal side of the game is quite accurate however as there is no indication to what is measured for the vocals (i.e. pitch, speed etc.) it is hard to tell how much so. Each of the moves are explained very well and you will find your avatar in the forefront of the screen performing the moves as well as the tutors parallel to you so you can efficiently read the move from both back and front. Aside from the campaign mode, there is also a party mode where two to four players can quickly jump, hop or skip into any song and start dancing with a simple score at the end and no ties to the campaign. Certainly valuable when there are friends over and everyone’s in the mood to dance or sing to the Black Eyed Peas. There is also a mode where you can create your own choreography by combining moves from all songs and then submitting it online to allow other people to play it. I thought this would be an interesting concept at first, but it turns out that the moves could not be custom created so making someone do crazy embarrassing things after doing them yourself is not possible at the moment (yet). The Black Eyed Peas Experience makes for a great party game, particularly if you are a fan of the Peas. If you are not however, this game will certainly make you reconsider as some of the songs really stick to your head. Although slightly gimmicky, the software does its best to cope with the ton of information and this game is especially recommended if you need a workout as some of the dance routines can get pretty extreme. Choreography is well done and moves are fittingly varied and explained well enough for you to mimic them. All in all The Black Eyed Peas Experience is actually a very good one. Had a chance to play the game? Tell us what you thought of it in the comments section below!